Opel IMMO Reader is a Windows based program that will work on any PC or laptop that has installed Microsoft Windows 98, 2000, ME, XP. Any PC or laptop with Pentium / 133MHz processor or higher, and a free USB port. Caution: This hardware interface requires drivers installation to work! Please use only drivers that are supplied with this product. There are no other or better drivers. Please disconnect your PC or laptop from Internet before install drivers ! Don't use Windows 'original' drivers! This is important! 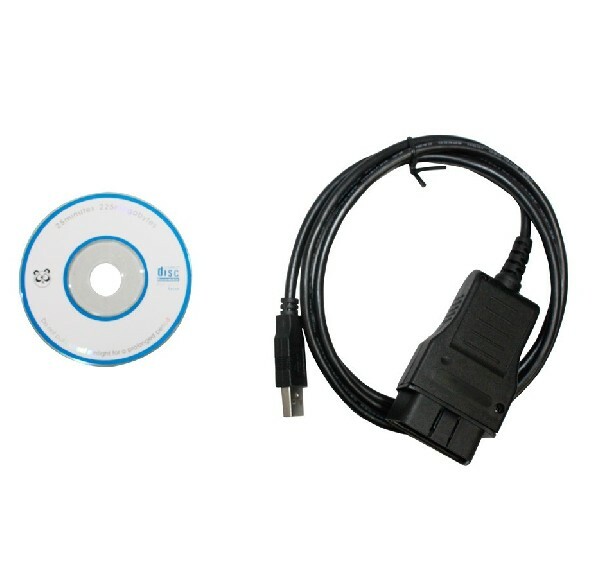 Connect OBD interface to any free USB port. This will start Windows procedure to install drivers for the new hardware found. Tell to Windows where the drivers are on your harddisk. If Windows tells you that the driver is not certified by Microsoft just confirm that you want to install it anyway. If you wish to uninstall drivers, go to control panel and uninstall drivers with standard procedure. Connect OBD connector to car diagnostic socket. Then connect hardware interface to any free USB port of your PC or laptop. 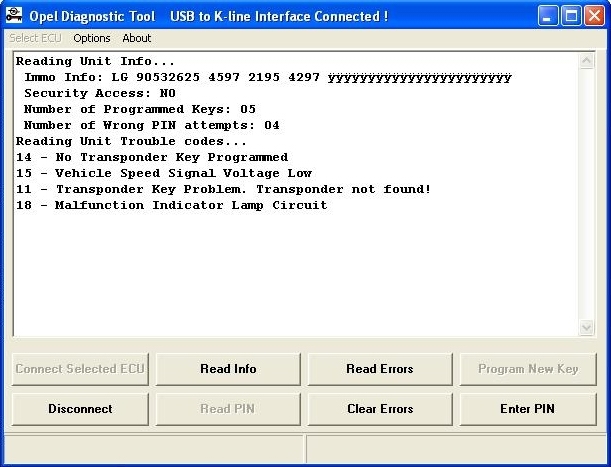 User can program up to 5 diferent keys to an immobiliser. Insert new key, and switch ignition ON. Press "Prog. New Key "
Message 'Reading key...' will be displayed on screen. Wait 10 seconds and turn ignition OFF. stop flashing, and light on continuously. Start the car to test new key. If there are error message when try to program new key, user can read errors to see where is the problem. Please read menu on screen, and all messages when they appear. There are detailed info for all commands. Command 'Read PIN' for immo1 works only if pin code alredy have been entered sometimes before. Immobiliser must be restarted, and OBD connector must be attached to the car, before try to read PIN code. To restart immo, just disconnect immobilizer connector for 5 seconds and reconnect it. 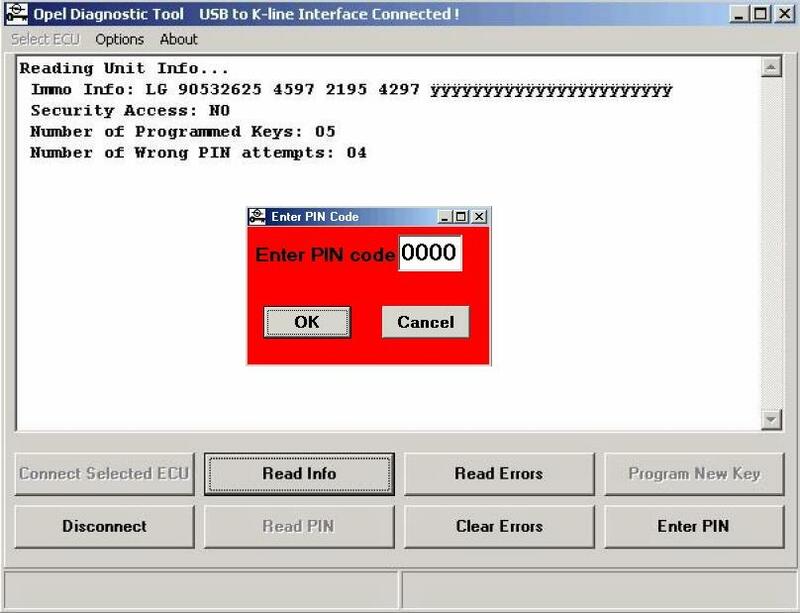 Reading of PIN code for immo2 is not possible by OBD. When you program new transponder without key, please keep transponder near as possible to the immo coil. - Transponder is not compatible to Opel immobilizers. - Transponder can not be read. - Transponder is alredy programmed to immobilizer. - Immo is busy, in this case repeat command again. - There are alredy 5 keys programmed to immo, there is no room for another key. Transponders for new model immos (crypto type) can be programmed to old model immo. Transponders from other cars, for example VW can not be programmed to Opel immos. Also sometimes transponder is programmed to immo, but car can't be started, in this case you are using a uncompatible type of transponder, for example transponders from Astra-G doesn't work with Corsa-C. There are many different types of transponders for Immo 2, depending on car, model and year of production.